According to the Frascati manual, drawn up by the OECD, experimental research and development activities (R&D) cover creative work undertaken systematically in order to increase the stock of knowledge for new applications. In order to measure total R&D expenditure, we can refer either to R&D performance or its funding by two key economic stakeholders: government and businesses. The term ‘government’ is understood here to cover government departments, public research institutions, higher education institutions and not-for-profit organisations. This definition is that used by the OECD. - gross national expenditure on research and development (GNERD), which covers funding from French businesses or government for R&D carried out in France or abroad. These aggregates are obtained primarily from the results of annual surveys on resources dedicated to R&D by businesses and government. The data on R&D in France come from an annual survey carried out on each institutional sector, which was conducted in 2014 and 2015 for the 2013 financial year. Changes in expenditure are measured in real terms, i.e. excluding price effects. Variations in R&D expenditure are estimated using the GDP deflator, i.e. the ratio of nominal GDP to real GDP. The method for calculating GDP was changed in May 2014 (GDP base year = 2010), (see chapter A7). Gross domestic expenditures on experimental research and development (GERD) has grown at an average annual rate of 1.6% over the past 15 years. This growth was driven mainly by the dynamism of domestic R&D spending by enterprises (1.9% on average annually). GERD accounts for 2.24% of GDP in 2014, or 47.9 billion euros. The companies carry out 65% of the R&D work carried out on the national territory and finance 61% of the national R&D expenditure. Overall expenditure on research and experimental development (R&D) is valued either in terms of funding by the French government and businesses, and performed mostly but not exclusively on French territory, or in terms of performance by the French government and businesses on French territory, taking into account foreign funding (see definitions). In 2014, funding of R&D by French businesses or the government, known as gross national expenditure on R&D (GNERD), accounted for €51.4 billion, i.e. 2.40% of the country’s national wealth (GDP). In 2014, businesses were the main funders of R&D activities, funding 62% of GNERD (diagram 26.01). In 2014, research and development (R&D) carried out in the national territory represented €47.9 billion in expenditure, or 2.24% of national wealth (GDP). In real terms, i.e. corrected by price effects, domestic expenditure on research and development (GERD) increased by 0.6% between 2013 and 2014. Businesses were responsible for 65% of this (table 26.02). By 2015, growth in GERD could reach +0.9% in volume, with spending on business (+1.1%) and government (+0.5%) increasing, but still lower than GDP (1.3%). 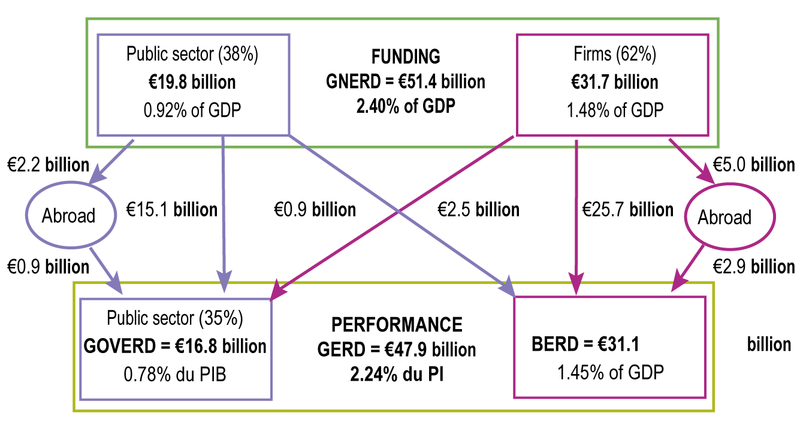 Total GERD should reach €48.6 billion and R&D efforts should increase (2.23% of GDP). Over the last 3 years, between 2011 and 2014, growth in research expenditure (+1.2% on average per year, in real terms) is greater than GDP by one point (+0.5%), thanks to the change in business expenditure (+1.7%). By contrast, the growth in government expenditure (0.2%) is lower than that of GDP (0.2%) (chart 26.03). Over the last ten years, average annual growth in real terms between 2004 and 2014 in business GERD was higher than for the government (1.9% compared to 1.1%). The difference between business and government is even greater in terms of the change in GNERD with an average annual increase of 3.8% for business between 2004 and 2014, compared to 0.6% for government. Since 1995, the financial contribution of business has been greater than that of government (chart 26.04) but its share is a little below the average for OECD countries. The difference between France’s total GERD and total GNERD represents the balance of R&D trade between France and other countries, including international organisations (table 26.02). In 2014, funding received from abroad and from international organisations (€3.7 billion) accounted for 8.0% of GERD financing. This was less than that spent by the French government and French businesses abroad (€7.2 billion). The government’s balance of trade with other countries was largely negative (-€1.3 billion). For companies, the balance, since 2012, is also negative (-€2.2 billion). The key international stakeholders, excluding major industrial groups such as Airbus Group, were the European Space Agency (ESA), the European Union (EU) and the European Organisation for Nuclear Research (CERN). With 2.24% of GDP dedicated to domestic research in 2014, France did not meet the 3% target set by the EU as part of the Europe 2020 strategy or its own target, as part of the national research strategy (SNR). It ranked 5th among the OECD’s six largest countries in terms of GERD (chart 26.05), behind South Korea (4.3%), Japan (3.6%), Germany (2.9%) and the United States (2.7% in 2013), but ahead of the United Kingdom (1.7%), Italy and Spain. Within the EU, it was the countries with medium-sized economies that devoted the largest proportion of their GDP to R&D: Finland (3.2%) and Sweden (3.2%). Extract from the chapter "26. 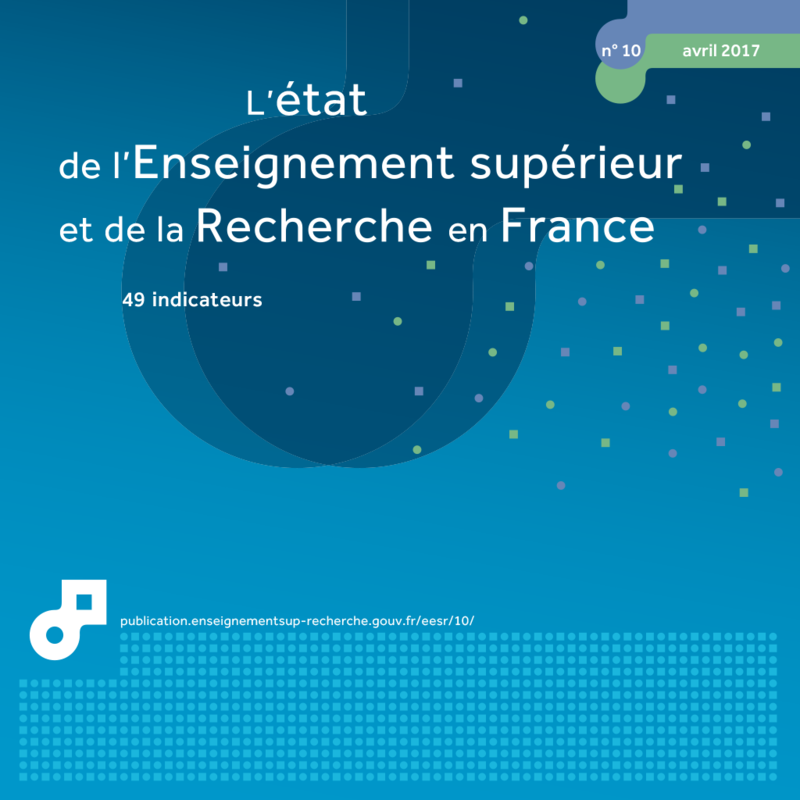 Research and experimental development efforts in France". 1 GDP in June 2014, change of methodology and 2010 as base year. 2 State and not-for-profit institutions (government, higher education and private non-profit sector). 6 With regard to the external expenditure of enterprises, the data for 2014 incorporate a significant change in the declaration of a company which did not previously account for its R&D expenditure towards the other companies in its group. Developments at this level should be interpreted with caution. Break in series in 1999.
r Change of methodology, revised data. 1 The European System of Accounts (2008) now recommends that funds spent by economic agents on R&D should be counted as investments, whereas they were previously categorised as intermediate consumption. As a result, countries that adopted this standard have had to significantly revise their level of GDP upwards for the entire period. In this graph, only data for Japan have not been revised. 3 Excluding (all or part of) capital expenditure. 4 GDP not revised according to ESA 2008. In 2014, according to the provisional data, gross domestic expenditure on research and development by business enterprises established in France (BERD) amounted to €31.5 billion. When corrected by inflation, BERD was particularly dynamic, with an increase of 2.3% in one year. It increased at a faster rate than in 2013 when it experienced a slowdown (+1.4% in 2013 after +2.9% in 2012 and +4.1% in 2011). Against a background of virtual stability in Gross Domestic Product (GDP), business research effort, which is the ratio of GERD to GDP, increased again to reach 1.48% in 2014, compared to 1.45% in 2013.